Today on our first trip of the day, the Cetacea traveled to the southwest corner of Stellwagen Bank in pursuit of whale sightings. Before reaching the edge of the bank, we found 5 scattered humpbacks. First we spent some time with our trustworthy friend, Orbit. Next we spent some time with Measles. Both were taking short dives and traveling. Next we spotted Dyad, another humpback whale. Dyad was exhibiting an odd dive pattern, it would surface, take a breath, fluke up dive, and then quickly resurface and repeat. We attributed this behavior to all the bait we saw close to the surface on the bait finder. Off in the distance we saw a fluking humpback, and were lucky enough to snap a picture of the individuals fluke. It was Isoceles, a type 5! We next went to ID our 5th humpback. As soon as the individual fluked, I knew immediately who it was. It was Coral, a type 1! Even though today was the first day that we spotted Coral, I was very familiar with its unique fluke pattern because it is on the first page of the catalog. I was overjoyed with the sightings. 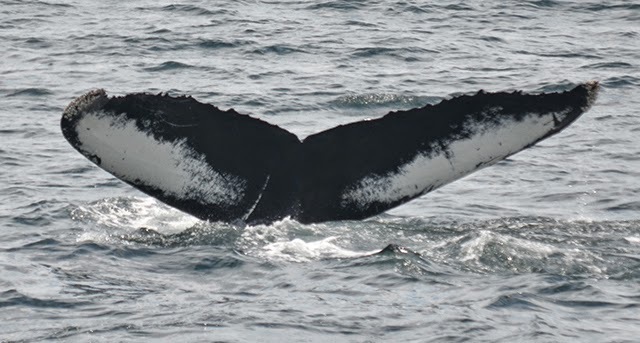 On the 1:30 whale watch on board the Asteria, we traveled back towards the southwest corner of the bank. Upon arrival, we found 2 logging humpbacks. It was Reflection and her 2014 calf. The pair spent almost the entire trip at the surface, which was great for passengers. We had lots of great looks, especially because of the beautiful weather and calm seas. The pair began to travel and did take one short dive, but were pretty calm otherwise. Today on board the Asteria we headed out to the Southwest corner of Stellwagen Bank. We spotted a minke whale along the way, but decided to continue ahead to an area further east. We happened upon the Cetacea, the 9:00 whale watch, who was watching a male humpback named Coral! Coral was taking long dives though, so we decided to travel to a different area to see what else we could find. 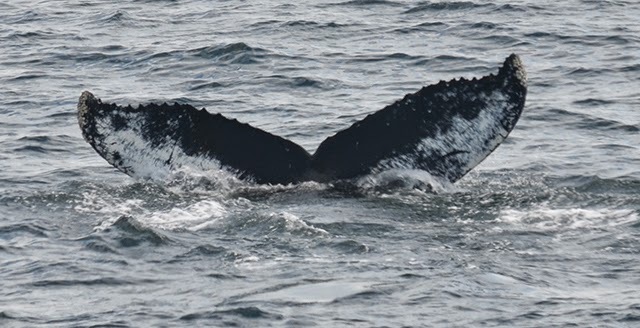 After quite the search, we were able to double back and find a bunch of associated humpbacks! There was a group of 4 humpbacks that included Eruption, Storm, Octave and one unknown (no fluke). The passengers were excited to see this group traveling pretty close by. 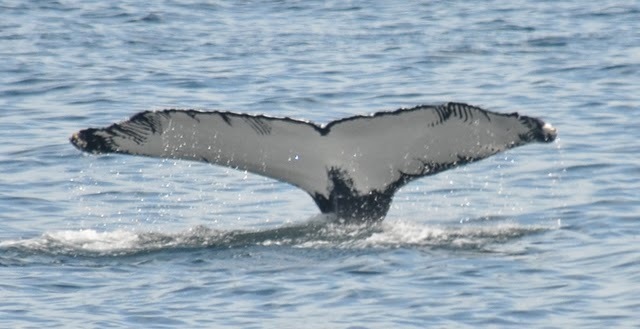 In the area there was a group of three, and a few other whales scattered around the area. It was a beautiful day out on the water! We are finally out of the fog!